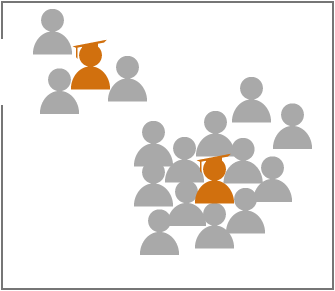 The Slovakian government has published the results from its 2011 census. The census looked at many things, including nationality and language. This should allow the government in Bratislava to better fund and support the ethnic minorities in Slovakia. Of course, some of my ancestors were one of the small ethnic minorities in Slovakia. Ergo, I have a personal interest in the data. The result is a quick infographic about the Carpatho-Rusyns of Slovakia. Click on the cropping below to learn more, meaning, see a bigger and fuller version. Credit for the work goes to me. For the data, the statistics office of Slovakia. In case you missed it, the weather the past few weeks has been hot across much of the United States. 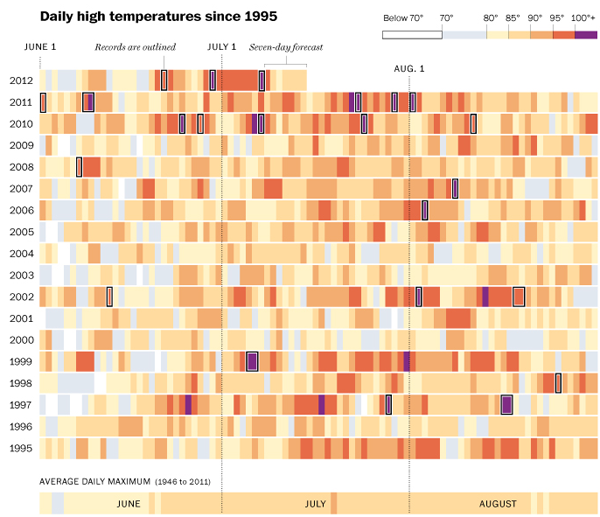 Last week the Washington Post published an infographic on temperatures in the District of Columbia. As it turns out, it has been hot. But it appears that in mid-June a few years ago, the temperature was below 70 degrees. Why can we not have some of that? Credit for the piece goes to Todd Lindeman. After an odd two short weeks—imagine two weeks with each only having a Monday and a Friday—we (in the royal sense of I) are back to the routine. So what better way than to look at American awesomeness in blowing things up. Through air strikes launched from US aircraft carriers. 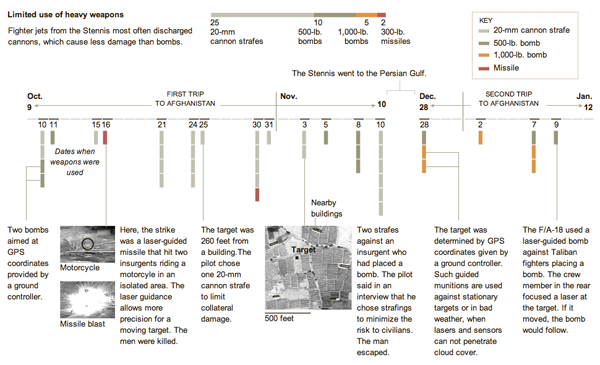 This graphic comes from the New York Times and looks at the changed nature of air warfare in Afghanistan. No longer are US fighters dropping bombs all over the place—during the early days of the war, aircraft would take off laden with so many bombs that they needed to drop some before returning to the carrier—instead they use cannon fire and use it far more sparingly. Credit for the piece goes to Sergio Peçanha. Venn Diagrams. Let’s Go Back to Grade School. 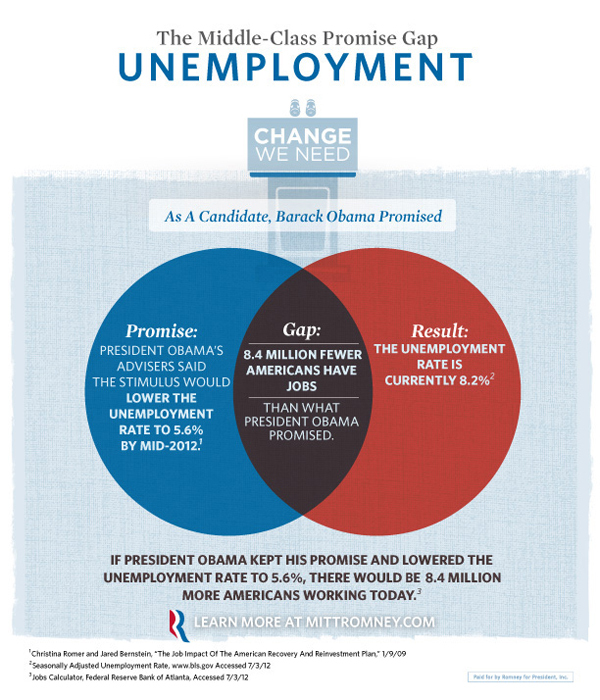 Last week Mitt Romney’s campaign released a series of infographic adverts. 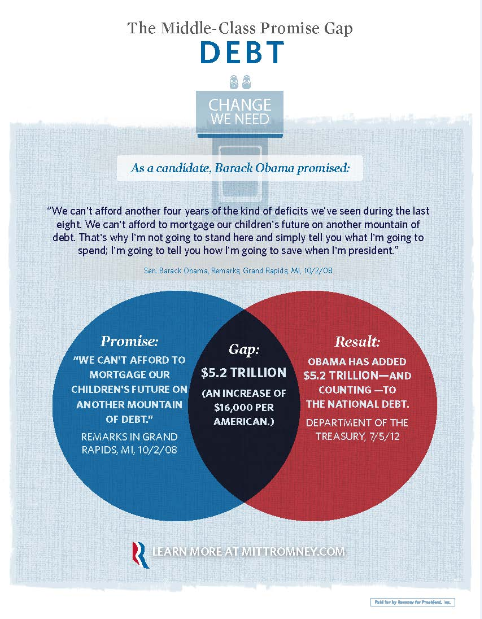 They were Venn Diagrams with messages attacking President Obama by highlighting what the Romney campaign called gaps between what the president has said he would do and what he has in fact done. The problem with these is that they are all wrong. Do not misunderstand me, the Romney campaign certainly has valid points in these statements. And to use an infographic to communicate their points is a valid approach. But whoever designed these adverts clearly did not know how a Venn Diagram works. Here is a brief refresher course for those interested. Unfortunately, the Romney campaign’s message is being lost in a failed medium. It’s like watching a clown give a doctoral thesis in rocket science. He sure might be making a good point. But it’s a clown. People laugh at clowns. People won’t take the clown seriously. 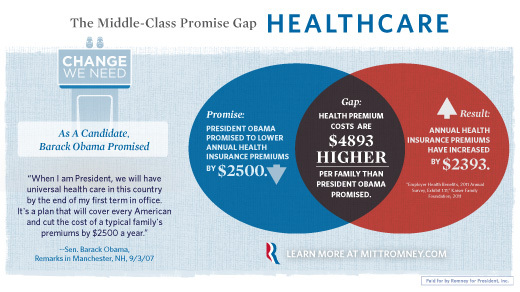 The Romney campaign is making good points, but that message is being lost because the campaign cannot master one of the simplest types of charts. Credit for the originals go to the Romney campaign. The bit on How Venn Diagrams Work is mine. 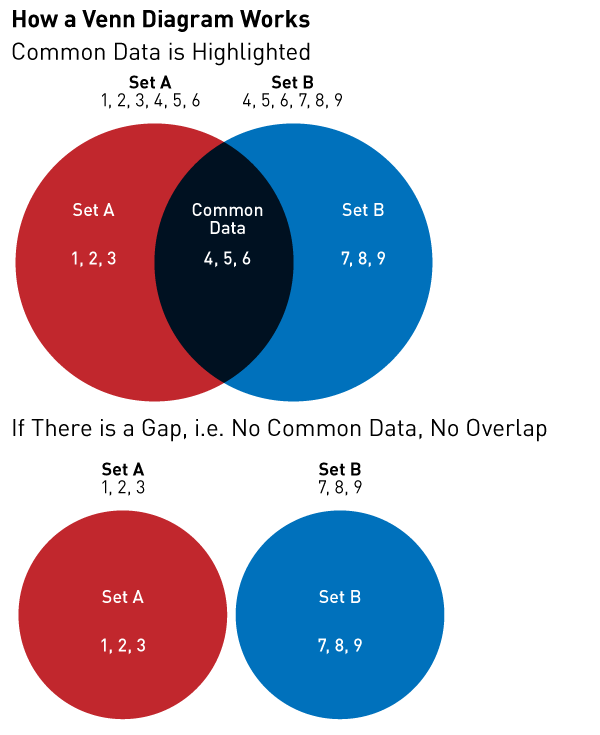 Author Brendan BarryPosted on 9 July 12 11 November 16 Categories Infographic, My WorkTags charting, diagram, infographic, information design, politics, theory, Venn diagramLeave a comment on Venn Diagrams. Let’s Go Back to Grade School. Higgs Boson. You Can Call It God. CERN may—or may not—have discovered a particle that may—or may not—be the Higgs Boson that would probably fill in a lot of the holes in our understanding of how the world may work at a sub-atomic level. That is a lot of ‘may’s. Understanding just what a Higgs Boson does is not quite so easy. In really simplified language, it explains why things have mass. And when you put things of mass on a planet that has gravity, like Earth, why things have weight. Back in the early 1990s, the British minister for science offered a prize for the best explanation to be given in layman’s terms. The following image, via the BBC, is one part of that example. We all probably need to know it just a little more today. Author Brendan BarryPosted on 5 July 12 11 November 16 Categories InfographicTags BBC, diagram, infographic, information design, science, technologyLeave a comment on Higgs Boson. You Can Call It God. 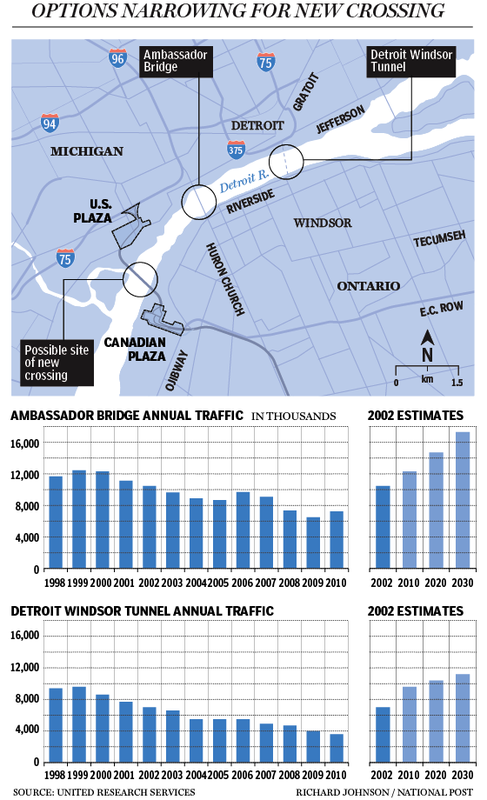 The National Post’s business section, branded separately as the Financial Post, posted a comment about a proposed bridge that would span the Detroit River and add a third major crossing to the Detroit–Windsor area. 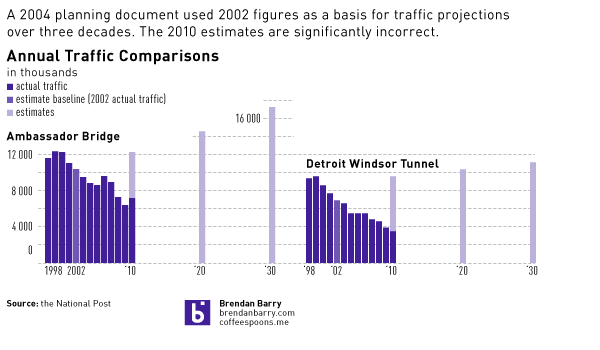 The comment used a graphic to explain one of the key points of the story, that early 21st century traffic projections haven proven to be very much incorrect. Unfortunately, it took me a little bit of time to realise that in the graphic. So without access to the raw data provided by United Research Services I have made a quick attempt to improve the graphic within the confines of Coffee Spoons’ main column space, i.e. 600 pixels. The original locator map is quite useful and therefore not included in my effort. My main issues with the charts are the separation of the estimates from the actuals and the spacing between the estimates. 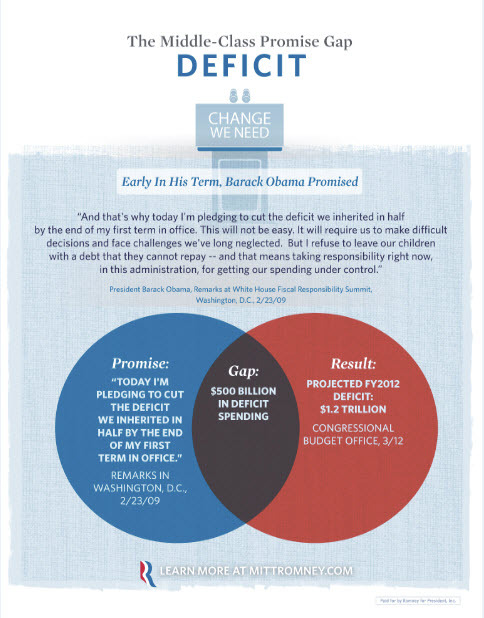 I would have preferred to have seen, as in my example, how the actuals for 2010 fell far short of the 2004 projections. Ideally, I would have liked to have seen the original estimates for the intervening years between 2010, ’20, and ’30, however that data was not provided in the comment if it is even available from the original source. Consequently, unlike the original, I have kept the spacing of the actual data in the estimates with the intervening gaps. The subtle effect of this increased spacing is to reduce the visual speed, if one will, of the projected growth. Over the original and narrower space the rate of increase appears fairly dramatic. However when given the correct spacing the ‘time’ to reach the projections lengthens and thus the rate ‘slows down’. Credit for the original piece goes to Richard Johnson. The reinterpretation and any errors therein are entirely my own. 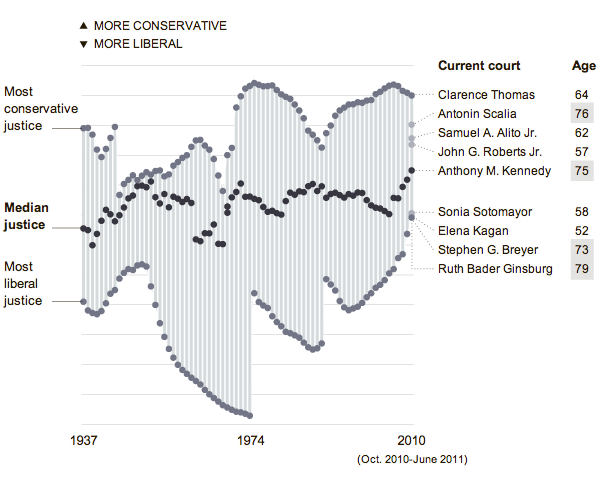 From last week’s New York Times, a look at the Supreme Court by age and political leanings. They’ve gotten a lot more conservative. Credit for the piece goes to Joshua Rapp Learn, Andrew Barr, and Richard Johnson. 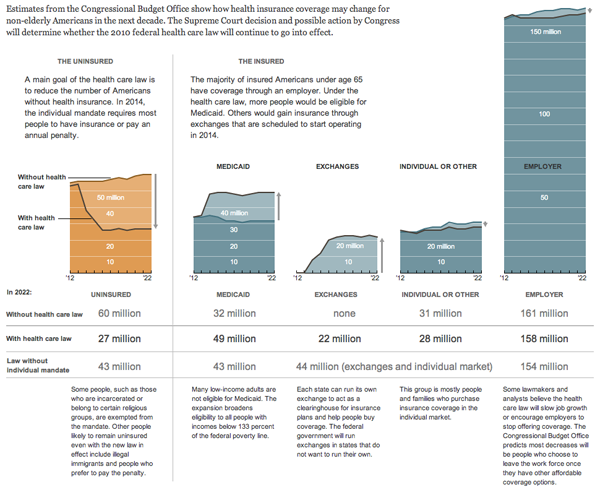 As the Supreme Court is likely to scrap the mandate provision of the health care law—without which sick people are left to pay higher premiums if they can get coverage at all—later today, the New York Times looks at the impact of removing the health care law changes the number of people without health insurance. Credit for the piece goes to Lisa Waananen. 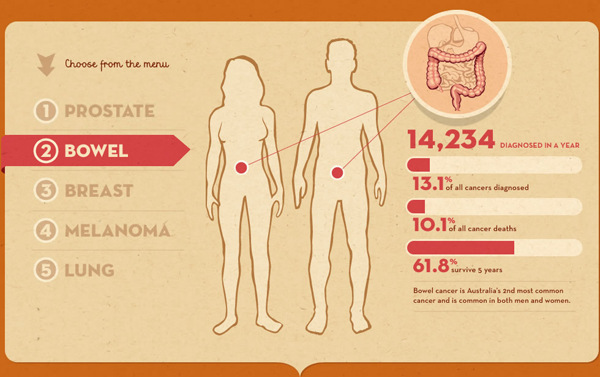 From the Sydney Morning Herald, we have a link to an interactive infographic published by the Cancer Council of Australia, a non-profit that seeks to reduce the impact of cancer upon Australia. It is not the most graphical by way of charts, but offers the user “playful” interactions with statistics to better inform him or her about the causes and impacts of cancer. 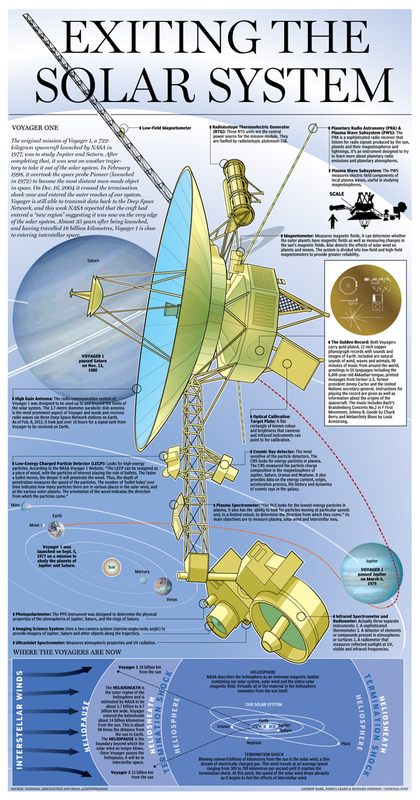 The format is also interesting in that it mimics the fad in infographics of the long, vertical scroll page. But here it is done to much better and ostensibly more useful effect. Useful in the sense of trying to help people.